Disclaimer: This is not a localStorage tutorial — see Chapter 7 of Dive Into HTML5 if that’s what you’re looking for. Read on if you’re still interested. Note that accessing the global localStorage object may throw an exception, so it needs to be done inside a try-catch block for this test. Modernizr does it this way (and documents the technique extensively in the source). It could be simplified a bit depending on the browsers and edge cases you wish to support, but for now this is the most robust feature detect out there. // Use `localStorage` here, e.g. Of course, this is nothing new. So why am I writing this? Well, I’ve been using a slightly different technique that has a few advantages, and I’d like to share it. This snippet actually detects if localStorage works correctly, by checking if the value that is returned by getItem() is the same one that was set using setItem(). If the localStorage feature detect is successful, its result will be truthy. So we append && localStorage, which causes the storage variable to become a reference to the global localStorage object if the test was successful. In other words, if localStorage isn’t supported, storage === undefined, which is falsy. If it is supported, storage === window.localStorage, which is truthy. Instead of returning false from the catch block, we return nothing at all. If an error is caught, storage will be undefined, which is falsy. It works just as well, and is even more efficient than the previous snippet because of the reduced number of function calls. // Use `storage` here, e.g. There’s only a single variable (storage) — and it can be used both to check if localStorage is supported and to manipulate it. By using the local storage variable instead of the global localStorage object directly, scope lookups are kept to a minimum. Consistently using a local variable that’s referencing localStorage results in a smaller file size after compression/minification. I’ve been using localStorage (and sessionStorage) in this example, but of course the exact same pattern could be applied in other cases as well. Can you think of other examples? I think the try-catch block is only for a bug in Firefox 4 beta, which has long been squashed. I simply use if (! !localStorage.getItem) which works well enough for me. localStorage.setItem, localStorage.removeItem can throw exceptions! Wrapping it with try-catch may be better. Paul Neave: For more information about why the try-catch block is there, see the Modernizr source which describes the Firefox issues (the article has this link as well). Update: comment #9 explains why it should be used regardless of browser bugs. P.S. In the snippet you’re using, you could omit the !!. Mathias: Yes, I read the Modernizr source — I think they’re being overcautious for the sake of Firefox 4 beta (which nobody uses anymore). I use the !! as a way of “truthyfying” the statement a bit more, so it’s not undefined but false, and can be stored in a variable like you suggested. No harm in being overcautious, but it’s an edge case for me. 4esn0k: I’d like to see which browsers actually do break when being tested for local and session storage. AFAIK it’s only Firefox 4 beta that breaks? So once this snippet is executed, storage is either undefined — if either 1) localStorage doesn't exist, 2) localStorage.getItem is falsy, 3) localStorage.getItem throws — or it references same object as localStorage (if execution got to the assignment part). kangax: I’m assuming the code is inside its own scope (to prevent leaking variables to the global scope), so storage isn’t supposed to be global. That said, your first suggestion would still work fine in a local scope! I’ve amended the article. Thanks! Modernizr later switched to a more robust feature detect instead (similar to the one John-David suggested here), and this post has since been rewritten. Speaking of localStorage being disabled… This snippet will determine if it’s disabled and return false instead of letting your code eventually facepalm on the disabled storage (tested in Chrome 12). Anyway we’ll keep an eye on it and hope to remove the try/catch soon. The user agent may throw a SECURITY_ERR exception instead of returning a Storage object if the request violates a policy decision (e.g. if the user agent is configured to not allow the page to persist data). If the Document’s origin is not a scheme/host/port tuple, then throw a SECURITY_ERR exception and abort these steps. User agents must raise a SECURITY_ERR exception whenever any of the members of a Storage object originally returned by the localStorage attribute are accessed by scripts whose effective script origin is not the same as the origin of the Document of the Window object on which the localStorage attribute was accessed. This means Storage objects are neutered when the document.domain attribute is used. I am working on an implementation myself. One thought is to have it return an array should it otherwise be false. As I don’t care where this data is being persisted, I will always have a storage object to work with. Do you foresee any issues with such approach? I realize my example was somewhat, to say the least, contrived. But, the idea was to have a single object without having to create a set of wrapper functions — which doesn’t make any sense now that I think about it. I need to implement a set of wrappers regardless. What can I say… It’s Friday afternoon! However, that still won’t allow you to do e.g. _userCache.getItem('foo') if localStorage is disabled or unsupported. I’m not sure how useful that is though, seeing as the _userCache object will be lost as soon as you close the page. Paul: Thanks for the heads up! Since this post used the Modernizr feature detect as its base example, I’ve now rewritten the whole thing to use the updated code. 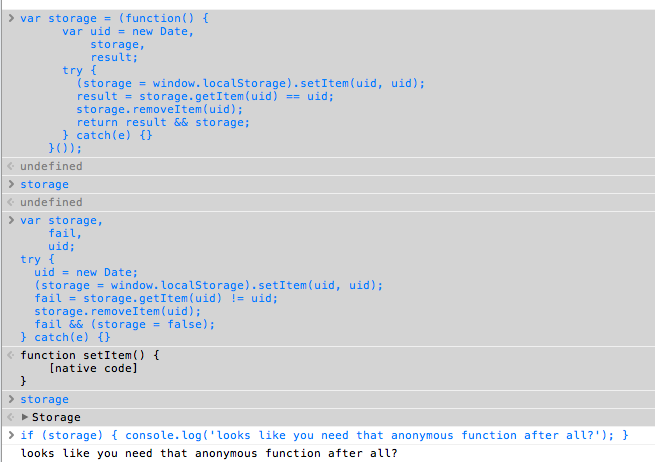 Why not just test for localStorage first, using if (typeof Storage !== 'undefined')? Yes, you gotta use typeof, otherwise IE 7 throws a fit. Phil: That’s a way to use feature detection. The snippet this blog post is about performs feature testing which is more robust. For example, an iOS device with private browsing mode enabled would pass your test, even though you can’t actually use localStorage in those conditions. It’s important to remember that this test, and Modernizr, don’t take into account the setItem failing because localStorage is at/near quota. No localStorage or a full localStorage will both result in a falsy storage value. This post helps me alot. Now, I can detect and use localstorage which will works well. I’m not clear why the set/get match is required; which case does that cover? For example, if the browser has localStorage support but the user has somehow disabled that (explicitly in their preferences or via private browsing) then the localStorage.setItem() throws an exception. So this seems sufficient (at the top of a function which uses localStorage)? // Code that uses localStorage goes here. You should definitely actively call setItem wrapped in a try…catch, because of Safari Private Browsing mode. If we are going to test functionality of localStorage.setItem, why not make it complete with one extra check that we actually get back what we stored? When localStorage is not available, it might be easier to use a dummy object instead of wrapping all use of it inside if blocks. If we go with a dummy object, why not make it functional? DB = localStorage; // Yippee, all is fine! memorystorage is a little library that I wrote that implements the Web Storage API in memory and can be used as a drop-in replacement for localStorage. No data will survive page-reload, but it would be wiped after the browsing session anyway in Private Browsing Mode. For more details, see my blog post on this topic: Introducing MemoryStorage. Stijn: I’m confused — the pattern in this blog post is already doing what you’re suggesting in points 1 and 2.